We're so close, people! The 100th TFA is right around the corner and it's going to be a treat. First, however, we're still at 99 and this too is a real treat. It's insane to think I've been doing these reviews for this long and now it's past time I got into discussing more classic shows that defined a generation, of which there are plenty. Today, we're discussing the acid trip euphoria that is... Fooly Cooly! I can't attest to how well FLCL did in Japan, but when it hit the States it became an immediate whirlwind sensation. And it makes me very proud to have been a part of that. This series is nutty, acidic, sugar to the max, but it's also so very much more than that. In only 6 episodes both Gainax and Production I.G. were able tell a heartfelt story about sexual awakening and growing up, what it means to climb out from someone else's shadow and make your own mark in the world while camouflaging that in full scenes of insane animation and sexual innuendos. 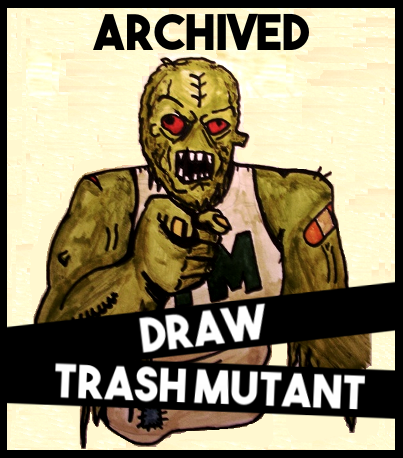 Promo poster. Click to enlarge. Naota is an endearing character because he starts out as someone who is very closed off from the world and his only real companion is his brother's ex-girlfriend, who also can't seem to take him seriously as his own person. He does have friends from his own class, but he easily shuts them away because of where he finds himself in the world. ​A recurring theme throughout the series is Noata constantly being called Ta-kun by the two main females in the series. The aforementioned ex, Mamimi and Haruko the girl with the guitar, who hits him in the head and begins this entire journey. Ta-kun is in reference to his older brother, whom Naota is desperate to be like. The kids in his class, his father, and his grandfather all call him by his real name because that's how they recognize him, but their opinions don't matter to Naota as much as these two girls. He can tell Mamimi sees in him her only link to the man who left her for the U.S. to play baseball, yet he has feelings for her regardless. It's possible that those feelings come from his need to live up to his brother, and if he has Mamimi he will be just like him. That's never explained, but that's sort of my takeaway as far as their relationship goes. Haruko and Naota have a hard-headed first impression. Though Naota begins the story closed off and lethargic it's really in the 4th episode “Full Swing” that he begins to change. As Naota finally starts his ascension into his own person, he figuratively and literally learns to quote-unquote “swing the bat” and move out of Tasuku's (his older brother) shadow. The driving force behind this change however is Haruko, who is the other major component to Naota's personality. If Mamimi is somewhat responsible for Naota's former loathing self, Haruko is responsible for his later confident self. You can see this throughout the show when Noata goes from spending all his time with Mamimi in the earlier episodes to ignoring her in favor of Haruko's company. Going so far as to leave home and school to travel around with her near the end. All of this moving and shaking feels natural, too, which is the most impressive part when you think about how much screen time is taken up by scenes that are meant purely for fun or having our heroes battle the new monster of the week. Let's talk about those parts of the shows because they're just as important. Now not all of these scenes are explained and most of the time you kind of have to just go with them. Such as the monsters who are constantly coming out of Naota and other character's heads at various times in the show. Haruko's power to call forth monsters from Naota's head is technically explained later but in my opinion the show still doesn't fully explain how some events play out because of it. It does, however, lead to a lot of great fight scenes and the fact that FLCL with all that it has going on can even fit in monster of the week fights and make them so entertaining is impressive enough as it is. 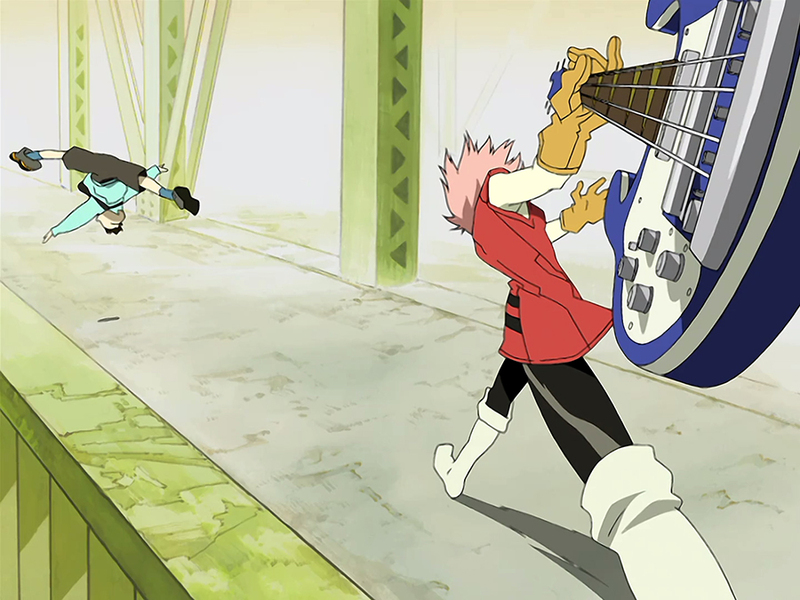 I love the aesthetic of our heroes using guitars to fight off the monsters who all look like hands (I'm not sure why they look like hands and I'm not sure why guitars were chosen for the weapon, but it's all cool, edgy and fun as hell, so I have no reason to question it). Gods come in all different shapes and sizes. There are a lot of different animation styles fighting it out in this show, something Gainax has never shied away from doing in other series. Here however it's cranked up to 11. Every episode features something new and yet keeps an overall aesthetic that holds it all together. You can see a lot of the origin for shows like Kill La Kill in this series, especially in the 5th episode “Brittle Bullet” which to me feels like it shares a lot of the same animation choices and I wouldn't be surprised if it shared an animator. It makes sense though, because Studio Trigger (makers of Kill La Kill) was founded by ex-animators from Gainax. There are also many different references in this series as well. There are two scenes that reference the manga of FLCL by throwing the characters into fully animated black and white manga pages. The show also self-references itself by breaking the 4th wall a few times. But it's the pop-culture references and references to other anime that are the real highlights when discussing all this. 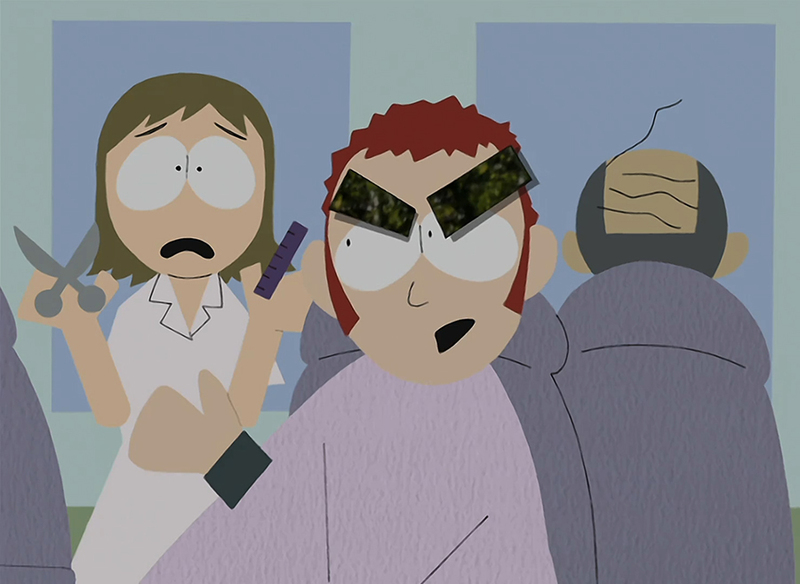 Within the show itself there's an organization that plays a major part in the last few episodes that in and of itself is a reference to NERV from Neon Genesis Evangelion, there's a whole scene parodying South Park of all things. 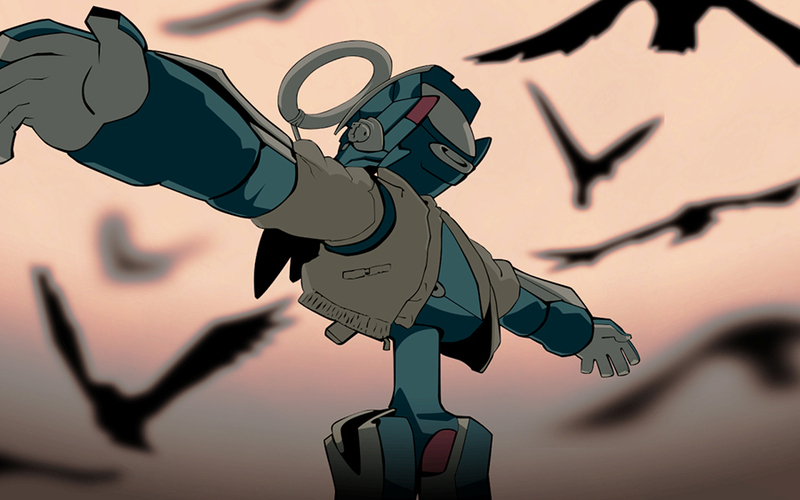 Lupin the 3rd, Mamoru Oshii, John Woo, the Daicon Animation shorts among many, many others fill out the checklist for FLCL bingo. Dat South Park referenece tho. If there's anything FLCL does wrong in its 6 episodes it's what I said earlier: there's too much going on. And while that be really fun an awesome at other times it keeps the story from really being more than spectacle even when it's trying to maybe tell you the reasoning behind some of the events. Which is to say those events are not explained well enough or not at all. At the end of the day it is pretty easy to walk out of the show feeling like you didn't really get anything out of it, and perhaps you didn't fully understand it. It all makes this show one of those that's simply better to understand by watching it again. And again. And again. 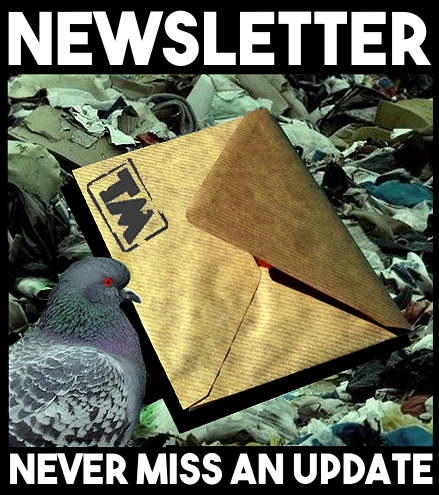 Because you can always get something new out of it. Unfortunately, that first viewing, depending on what you look for in a story, can or cannot be a real home-run of an experience. For me personally it definitely was, and for a lot of people I know it still was, but I also know a few that didn’t like it at first. Their major gripes were that there was too much going on and it didn't feel like much of anything was explained properly. Having re-watched it recently I can understand their sentiments. Finally, let's talk about the music. The Pillows, man. This rock band from Japan launched to superstardom because of this show thanks to the various music they provided for it. And while I've listened to a lot of their works outside of their FLCL-related songs I don't think they've ever done anything that has truly exceeded the works portrayed in this show. 'Ride On Shooting Star', for instance, is their very best song in my opinion and like almost everyone else I was introduced to it through Fooly Cooly. If you've never watched this series you've probably at least heard of it. There's few ways to overstate how important this anime is to a generation of fans and hopefully, with the recently announced sequels (yup, multiple!) in the works by Production I.G. and Adult Swim (yes, that Adult Swim) it can become just as important for a whole new generation as well. Especially if they do it right. 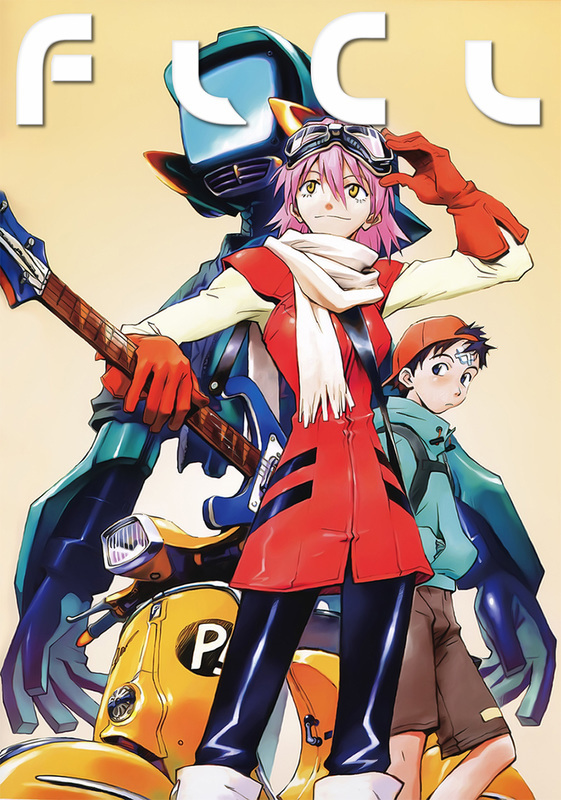 Have you seen FLCL for yourself? Let us know all about it in the comments! Tagged: Tentacle-Free Anime, movies & TV.